We all have to work with people we can't stand to be around. Our challenge is to find creative ways to handle these difficult people. In the fable Make Difficult People Disappear, the skills and strategic plan needed to change your mindset are told through a clear, concise story. By first understanding the four main personality types in the workplace, Commander, Organizer, Relater, and Entertainer, readers can then devise effective strategies for diffusing unproductive and damaging behavior. This book serves to change the mindset and behavior of people who deal with difficulty on a regular basis. 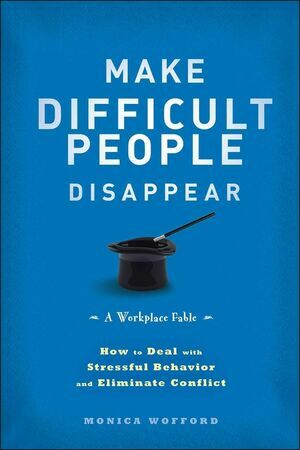 Complete with a step-by-step action plan, Make Difficult People Disappear serves to replenish your confidence and build skills in leading those who until now you didn't know how to manage and felt there was no choice but to continue to deal with or ignore. Monica Wofford, CSP, is the CEO of Contagious Companies, Inc., a training and consulting firm specialzing in the transformation of managers from those promoted, but perhaps not prepared, into high performing leaders. She’s had the privilege of working with organizations such as Estee Lauder, the United States Mint, the FAA, SeaWorld, and the Department of Education, and has engaged audiences in all fifty United States and seventeen Countries. When not serving clients and leading her own team, Monica is an active member of the National Speakers Association and the International Society for Performance Improvement.